Da schlägt uns die rettende Stund. Sheet music from Thomas H. Jappe, Elements of German Grammar (New York: American Book Company, 1905), p. 100. 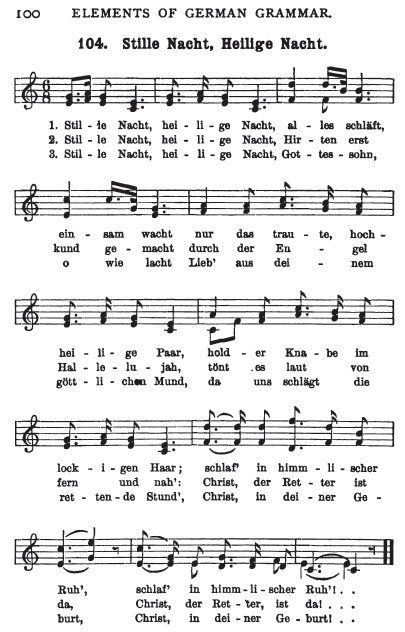 A side-by-side German and literal English translation can be seen at Stille Nacht Gesellschaft (and also reproduced here in Silent Night - Free Translation). An additional six English translations (among the over 200 in 135 languages) can be found at silentnight.web.za. According to John Julian, the bulk of the translations were from the copy printed by Dr. Johann Hinrich Wichern, Unsere Lieder (1844). The fifth edition was published by Agentur des Rauhen Hauses in 1877. (Dictionary of Hymnology. Second Edition, 1907, p. 761). The first translation (the "original form" according to Julian) was also published by O. Kraus, 1879, p. 608. Other publications were in T. Fliedner's Lieder-Buch fur Kleinkinder - Schulen, Kaiserswerth, 1842, No. 115, and the Evang. Kinder G. B., Basil, 1867.